A black stallion most well-known for his memorable freestyle reining exhibitions at Youth Nationals, Black N Style is a 1991 son of Wizjon and out of the Strike mare Peptyka. 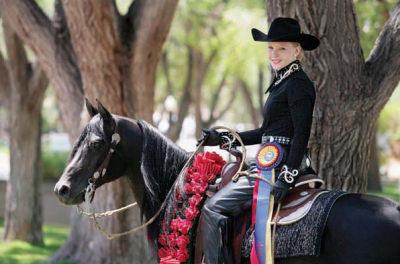 Throughout his reining career, Black N Style has amazed countless Arabian horse enthusiasts both with his technical ability and willingness to don outrageous costumes for freestyle reining competitions. Black N Style’s accomplishments are countless and include multiple regional, Scottsdale and Buckeye titles as well as U.S. Canadian and Youth Nationals’ titles. At 19, he is still being shown in the reining division.